After holy week, the children are looking forward for Easter egg hunting. Easter eggs have been a tradition for a long time and these represent fertility and new life. The first Easter eggs have red color paint. 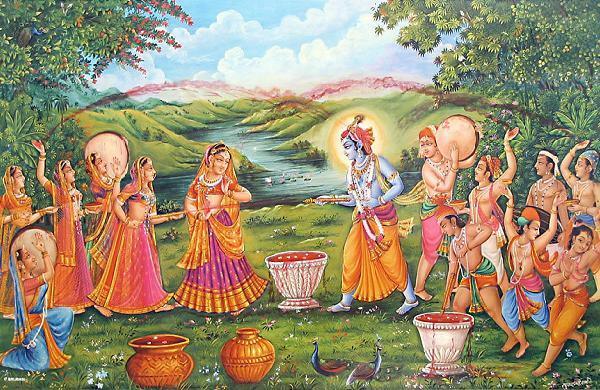 Soon we became accustomed to painting the eggs with different pastel colors. Now the Easter eggs paints comes with different shades and this time people are thinking of new ways to change the look of their eggs. The adults are buying several eggs and art tools for designing the egg. They may buy paints, pen, cardboard, ribbons, laces and other craft materials. 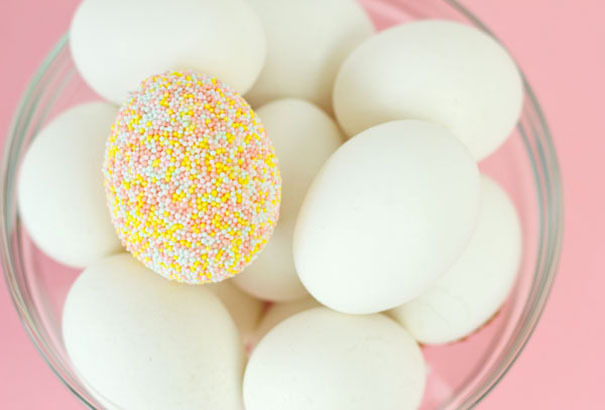 Design your egg with Nonpareils in pastel colors. Using bright colors makes it more visible for egg hunting. 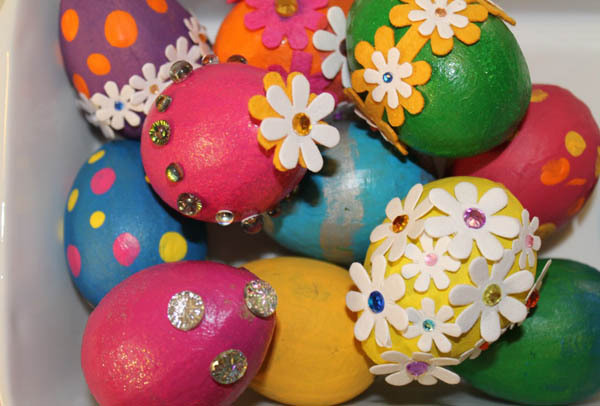 You can also use glitters for covering the egg. This will surely give the egg an appetizing look. 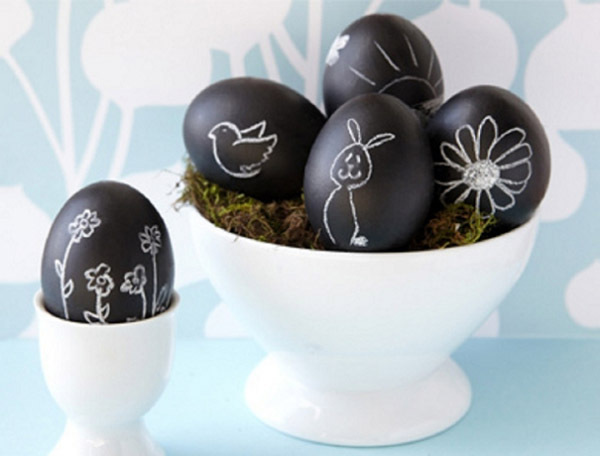 Create an eccentric Easter egg by painting it with black. Ask a child to get a chalk. Then let them draw flowers or birds in the egg. Add a few moss or grass and display it a bowl to make it more real. 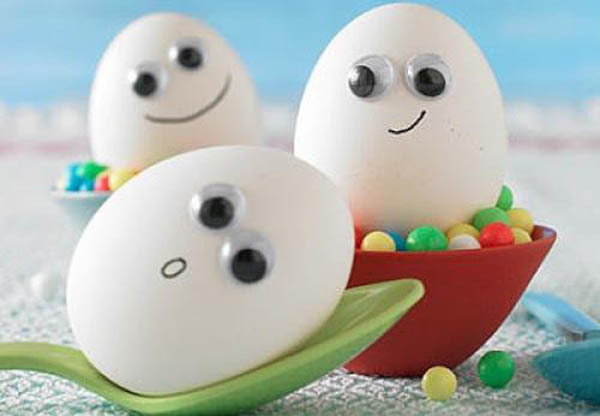 Find small fake eyes in the market and glue it on your egg. Then draw a smile to complete the face of the egg. Have fun making different expressions of face in the egg. 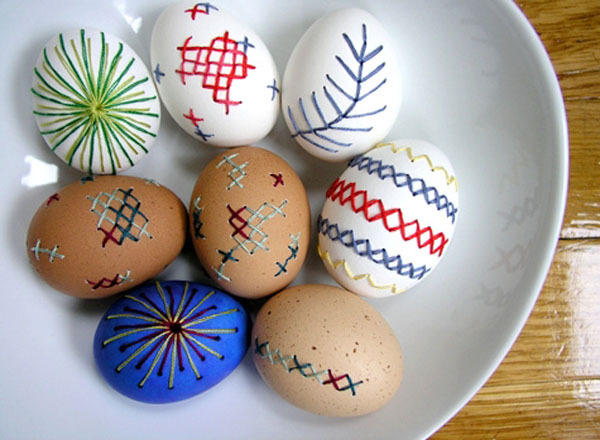 Wrap the eggs with colorful yarns. Yarns will make the eggs soft to touch and easy to use for playing. It will also be fun to mix different colors to get more variations. 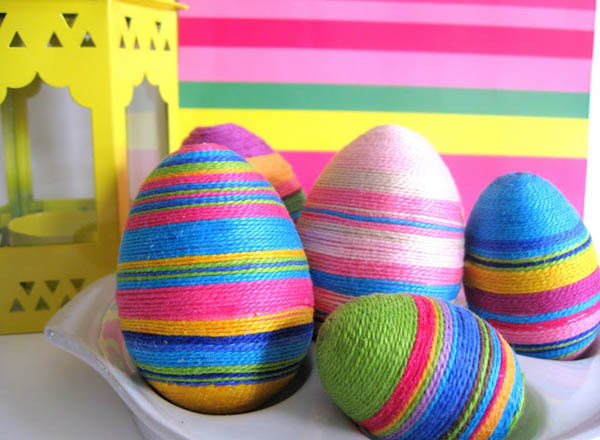 How I love the combination of colorful, almost rainbow-colored Easter eggs wrapped with yarn. 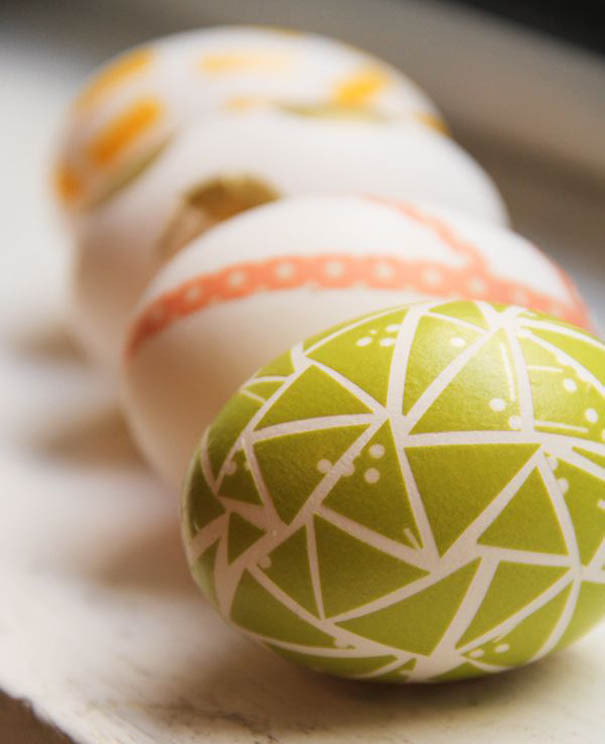 Toss your glue for a moment and try sewing the design in your egg. Make a pattern for cross-stitch or other types of stitches. Create holes in the egg using a mini drill then start sewing it. Do you have leftover designs from your scrapbook? You can use the designs like stars or flowers to design the egg. You can also choose other designs like hearts or diamonds. 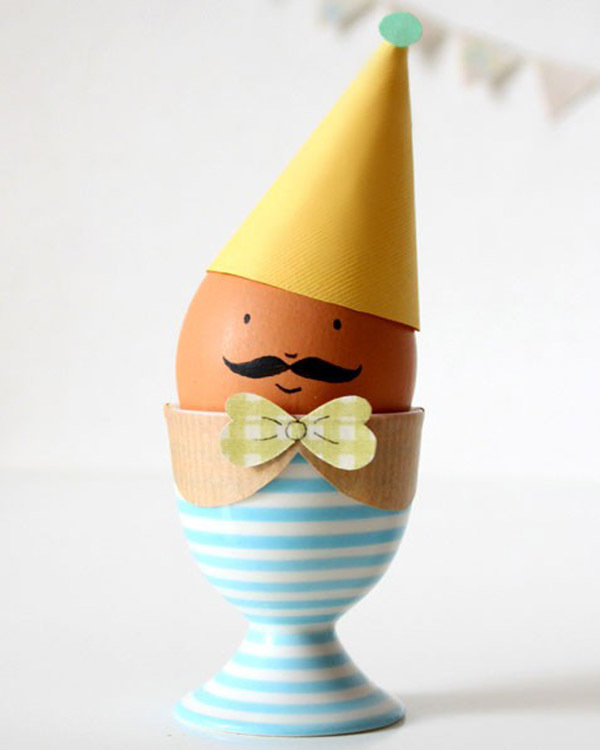 Easter eggs can be your mini puppet. Match the egg with your personality. Dress your egg with a bow tie or lace for female. 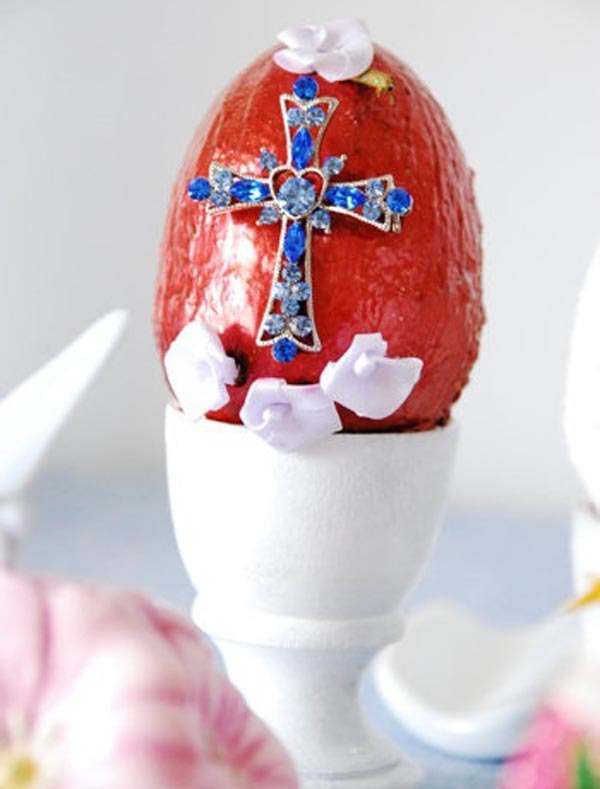 Cut out a hat or sunglass to accessories the egg. You can also match it with the egg hunter’s personality. For those who kept dried flowers in their books or box. It’s about time to use it for display or collection. It is a good design for Easter egg. 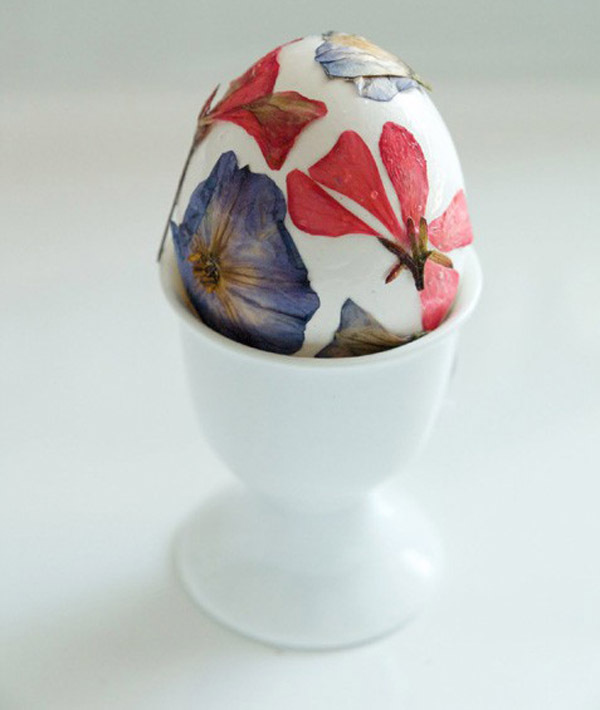 You just need to stick those pressed flowers to your hard boiled eggs and voila! You now have a floral Easter eggs. Plan Easter egg hunting for the night. 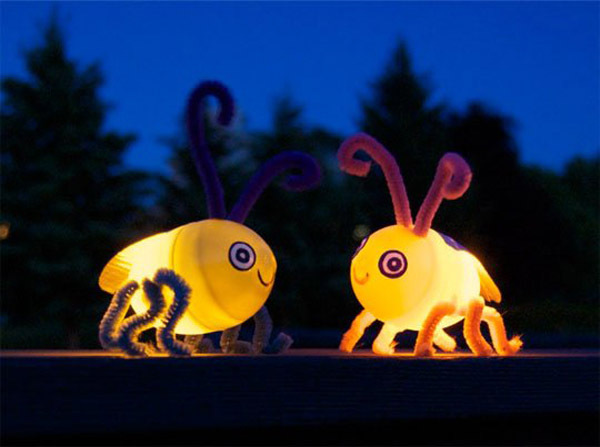 Make a beautiful Easter egg with Led tealight to attract the hunters. Try to make it look like a bee or a butterfly so children will have fun playing with it. You can make stunning designs with a washi tape. Create geometrical cuts like triangle or stars and tape it in the egg. You can also use linear patterns for designing the egg. 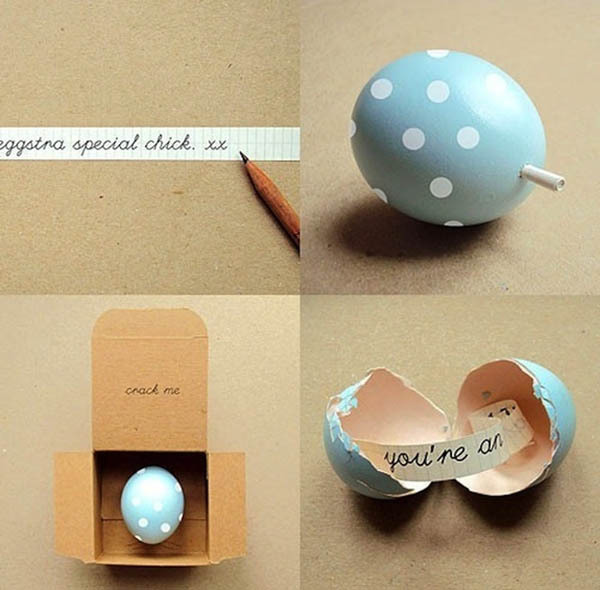 Adding a message for your Easter egg can make it more meaningful. Write a note in a stationary and place it inside the egg while it’s open. Then seal it with a cute design. 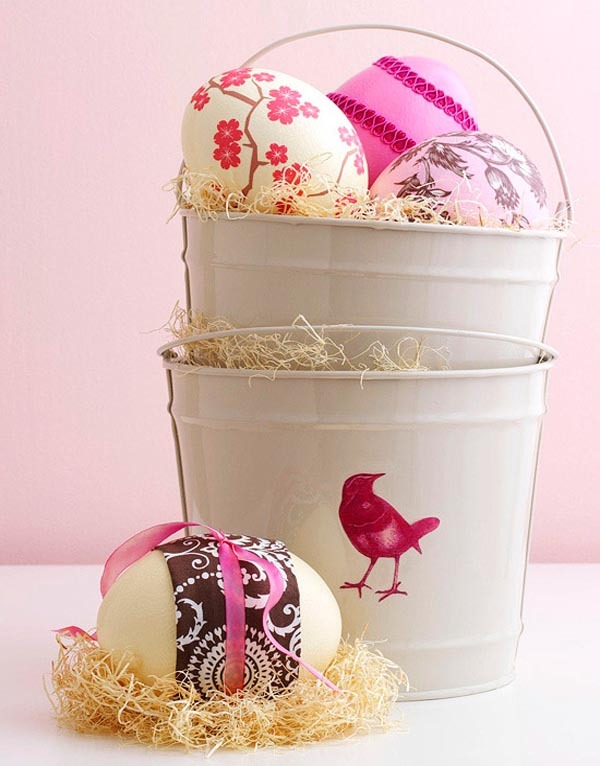 Use a fabric or lace to design your egg. Then use a glue gun to stick the fabric in the egg. 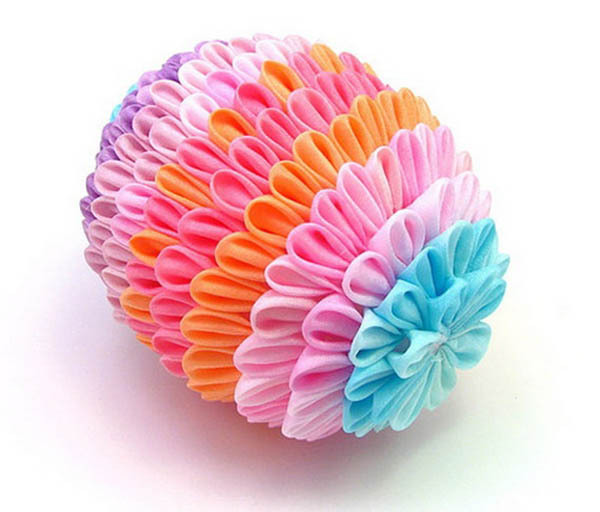 Fabric or lace can make your egg look like an origami. 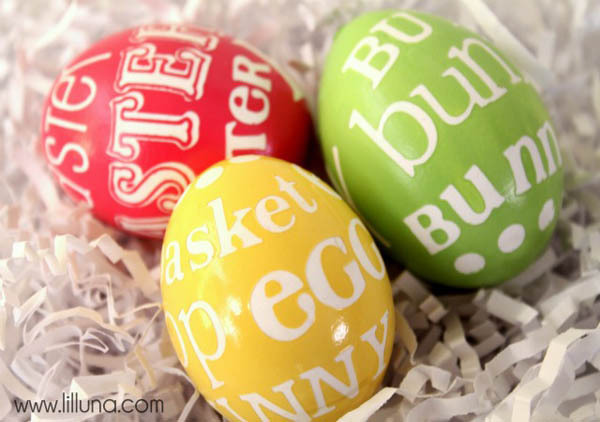 Help the kids find their egg by labeling their names on the eggs. Since they have their names on the eggs this will ensure that, everyone gets an equal share. Set a mood for your Easter egg hunting occasion. 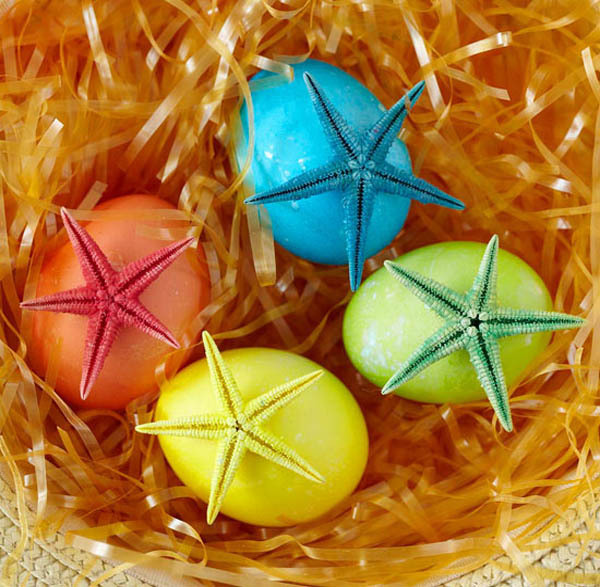 Decorating the egg with starfish will make it look like an egg found on the beach. 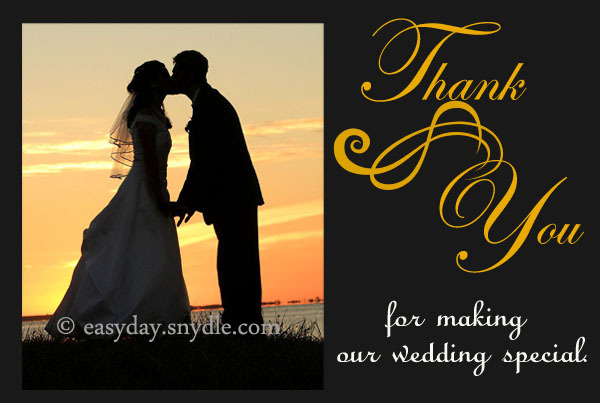 You can also use seashells or small pearls for design. 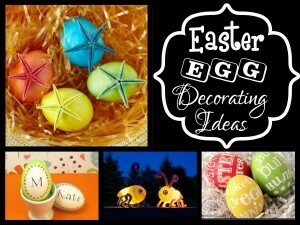 Emboss the eggs for Easter with inspirational message and cute designs. Place it in a small flowerpot. Serve your egg with a smile. Use an empty egg or a plastic egg. Open the egg and add chocolate or candies. 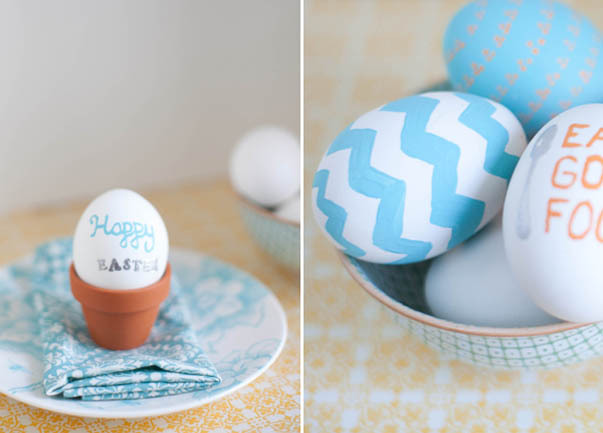 Paint the Easter eggs with acrylic paint. 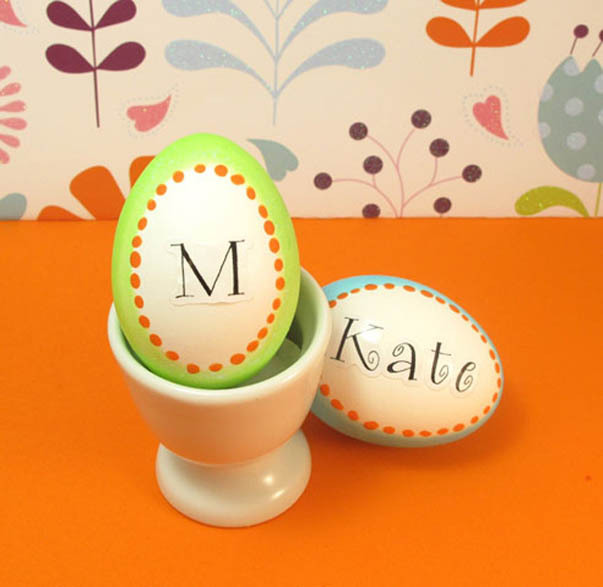 You can add vinyl to write your name or your design on the egg. 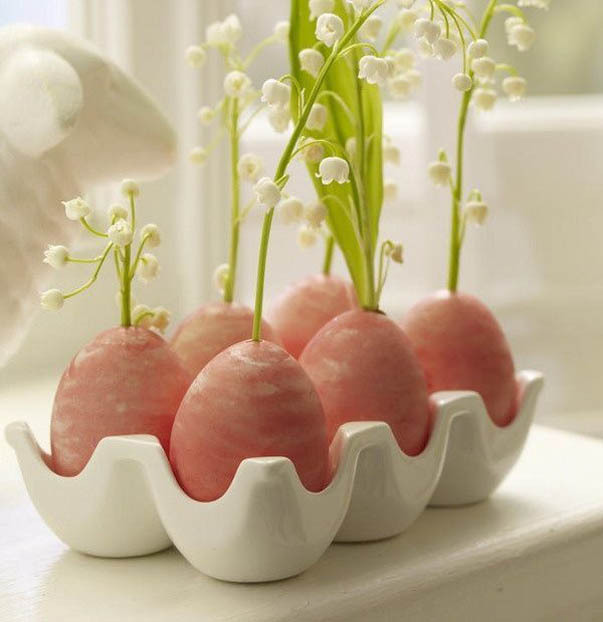 Surprise your guest with an Easter egg plant. Decorate it with onion husk to make it look like a real vegetable. 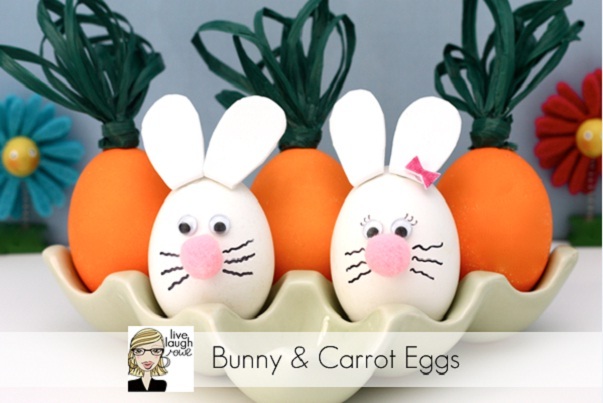 Design your eggs with the two symbols of Easter, which is carrots and bunny. For the bunny, you can cut out the ear from a cardboard and glue it on the egg. Add the eyes, nose, and draw the whiskers. Paint the rest of the eggs with orange and add a tie. They are pretty eggs in pink color. Attractive floral designs for a female Easter egg hunt. Place them in a pail or basket. Show your faith in religion by making a design that will symbolizes your belief. It may be a crucifix or a simple message. You can also use it to teach the kids about your religion after Easter egg hunt.